SUNRISE, Fla. -- He could be enjoying a bye this weekend before the New England Patriots resume play toward another Super Bowl push. Instead of being in the possible twilight of an NFL career, however, 6-foot-7, 241-pound Montreal Canadiens defenseman Hal Gill is into his 14th NHL season at age 36 and providing continued highlights. "I had to choose between football and hockey [after high school]," said Gill who hails an hour away from the Patriots' home of Gillette Stadium and even less from the Bruins TD Garden. "I couldn't give up hockey, so Providence (College) was the school that came after me. I figured that was my best opportunity." Holiday tournaments and a marquee game on Versus (rebranded Monday as the NBC Sports Network) filled last weekend's NCAA schedule. * Maine beat Massachusetts, 5-2, in the Florida Classic in Estero, Fla.
* In the Great Lakes Invitational in Detroit, the University of Michigan took out arch-rival Michigan State in 2 OTs, 3-2. * In the Mariucci Classic in Minneapolis, host Minnesota was toasted by Northeastern, 3-2. * The UConn Hockey Classic in Storrs, Conn., saw Massachusetts-Lowell take down host Connecticut, 4-3, in overtime. * The marquee game to ring in the New Year pitted Boston University against Notre Dame in South Bend, Indiana, Saturday night. The Fighting Irish toppled the Terriers, 5-2. The Concord, Mass., native has figured right most of the past two decades, which featured four stellar seasons at Providence from 1993-97, eight with the Bruins, a Stanley Cup title with Pittsburgh in 2009, and an Eastern Conference Finals berth in 2010 with Montreal, his first season there. Gill stood -- make that towered -- outside the Canadiens' locker room New Year's Eve after a 3-2 loss to the Panthers, his 1,028th game in a durable NHL career featuring stops in Boston, Toronto, Pittsburgh and Montreal. In nine of those seasons, he played at least 70 games; in five, over 80. "For sure, the NCAA was the route that made this possible," Gill told NHL.com. "Obviously you dream of playing pro, but my first thing was try to get a scholarship and an education. It was a smaller school that I thought was fitting for me, and close to home, but not too close. It felt like they wanted me and wanted me to be successful." Providence was also quite the fit for other notable NHL figures like Devils President, CEO, and GM Lou Lamoriello, who was coach and athletic director there before founding Hockey East and serving as its first commissioner in the mid-1980s. Toronto President and GM Brian Burke and head coach Ron Wilson were Friars teammates when the school was in the ECAC league, and Chris Terreri, the 1985 MVP of the NCAA Tournament, won two Cups with New Jersey in 1995 and 2000 backing up Martin Brodeur. Wilson is the all-time NCAA leader in career points by a defenseman with a whopping 78-172-250 stats line. 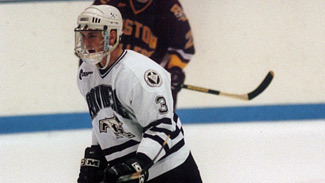 "In 1996 we won Hockey East," Gill said about the school's last and only second league title in program history, "and the NCAA tournament was a great experience. Those are great bonding things and a great thing to be a part of. "Getting to that tournament was my first experience in a big-time game (5-1 loss to Minnesota). All the other games you're kind of learning how to handle situations to get to the big ones." That learning process in Providence was key to Gill's longevity as a pro and handling situations from breaking into the NHL with Boston to making the Stanley Cup run in Pittsburgh. "When you go to university, I did a lot of growing up, being a man and trying to figure out how to handle myself," he said. "Also, getting in the weight room and some meat on my body; I was pretty lanky and a little uncoordinated, so I spent a lot of time in the gym and grew up as a person." The Bruins tabbed Gill at No. 207 in the 1993 Entry Draft for one simple reason. "It was the [size factor] that got me drafted," he said. "I always kept being drafted in perspective and did not rush too far ahead. I knew I had a lot of work to do. I didn't play enough competitively in high school to be considered [draft-worthy]. It wasn't skill, just size, and someone took a chance on me and it ended up working out." Not without a little support, determination and maturity. The details of Gill's NHL genesis in Boston are well-chronicled. Coached then by the late Pat Burns, it was assistant coach Jacques Laperriere who convinced Burns to stick with Gill. On the eve of Gill's 1,000th game a few months back, he told NHL.com about a conversation way back in 1998 in which Burns stated: "Well, Jacques wants to keep you around. I don't really see it, but I'm going to go with Jacques on this one." Gill would go on to become the eighth Massachusetts-born player to play in 1,000 NHL games, and that state's first defenseman to do so. "That was pretty awesome playing a thousand," he said. "I never really looked at it." As 2012 was about to begin Saturday night, Gill reflected about the irony of being on the Canadiens' roster when a city and country paid tribute to Burns last year at the Bell Centre after the affable and colorful coach succumbed to a courageous battle with colon cancer. "Pat was such a (tough guy) when I first played for him. He was mean and nasty and he was right in your face. But as we went along, I got to see him in charity events and got to know him as a person," Gill said. "He was a great guy who made me grow up a lot more than anyone else. When I got [to the NHL], he told me what I had to do and how to be a man playing hockey. Pat and Jacques took a shot on me and gave me my chance." Gill has made the most of that chance in four of the most difficult cities on the NHL map. "It's tough when you're playing in these markets with a lot of pressure with a lot of people around you who are into the games," he said after facing the Panthers. "You come to a place like here in Florida and guys are left alone to just play. But it's fun and makes your life interesting, that's for sure." Of the four stops these past 14 years, Pittsburgh and Montreal have created the most fun and interest for Gill. "I think when I got to Pittsburgh (in 2007), we had a great run, and the second year was the best of my life. But being here and going to the third round (in 2010) and having that excitement, especially in Montreal of all cities, (it) was disappointing we didn't go a little further but that was a great run," Gill said. The Pittsburgh run ended with Lord Stanley being hoisted higher by Gill than any other Penguin in the celebratory skate. "You don't realize what the Cup experience is until you get there," he said. "Everybody talks about how great it is to win the Cup, but it's the journey and what it takes with a lot of pain and ups and downs. It's not about getting the ring and it's great to hold the Cup, but it's more about going through all that stuff to get there." For Gill, getting anywhere in his career has required the ability to adjust and play a very disciplined game within his abilities. "I've adapted a lot and the game has changed since I first came in and I've adjusted to that," he said. "Size helps and I use that, but it's more about reading the play and learn as you go what player's tendencies are to anticipate passes and plays. You have to keep it simple and play to your strengths. I expect to get the puck and move it as quickly as I can; not beat a guy. Just make the simple play to get out of my end. You find out quick when you get to this League what you can do and what you can't do. "The hard part is finding that niche and be successful with your tools. You wake up every day and do the best you can to keep going." His 131-game NCAA career culminated in 21 points his senior and a degree. "I still keep in touch with the program at Providence. Nate's (coach Nate Leaman) straightened out a few things to get them in the right direction," he said. What comes for Gill after he hangs up his skates? "I don't know what comes after playing," he said. "Take it as it comes." It has come pretty good for Hal Gill.